One sublime shooting performance after another, it is becoming very clear that Steph is reaching the insane levels unheard of since the MVP days. 45 points in 3 quarters in Los Angeles on Saturday, and a 32-point explosion on 5-10 3PT shooting capped by a 25-foot 3 pointer in the face of Will Barton. It was reminiscent of the one in Oklahoma City except this was actually contested. The shimmy after, the cocky dance, and the arrogance to even pull that off to effectively end the game, brings all the confidence and sheer unstoppable vibe that the Warriors have cultivated over the past 3+ years. This won’t last forever. They needed a Peak Draymond Green show to the tune of 23 points, 10 dimes, 6 boards, 3 blocks, and a steal. They need another beautiful old school performance from David West and Shaun Livingston, and even a spark of Swaggy P. And the Nuggets didn’t blink. Mike Malone after the game was complimentary of their team’s effort, especially Nikola Jokic’s triple double that brought Denver all the way back from a double-digit deficit to take the lead in the third. It felt like a team that despite knowing they would lose, took solace in the moral victory of simply competing. And all of this with Kevin Durant sitting on the sidelines, slowly healing from a calf strain. The Warriors have now won 22 of 23 games without Durant playing, but the thunder strikes are happening with much more certainty with Curry at the helm instead. With Curry off, and even when Durant is on, the Warriors immediately and seamlessly transform into a defensive juggernaut that struggles to score in the halfcourt and spread the floor throughout. Fitting those two together at full strength, a task that now seems like a century ago, multiplies the efficiency and power into light years. As the Warriors head into the latter half of the regular season, it’s not about the team starting to hum but the players that need to round into form. 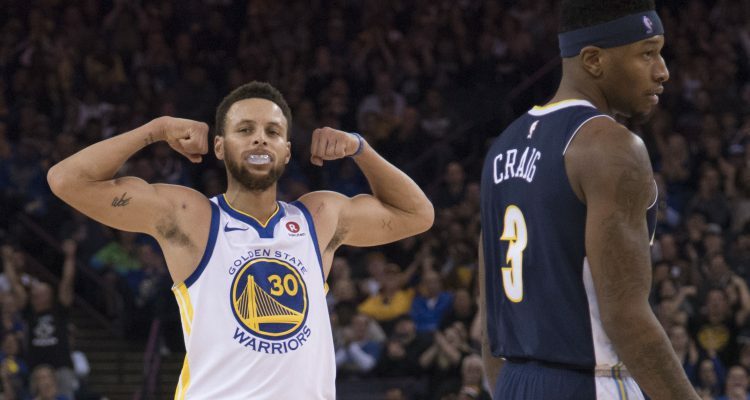 Yet the Warriors have had the luxury to remain flexible in their identity, omnipresent with their versatility, and still come out on the other side with more potential and readiness than ever before. Steve Kerr’s team can beat anyone else any which way and it’s quickly becoming clear with the Nuggets effort and attitude postgame that the rest of the NBA is starting to feel the sheer force of this power.